How To Play Roulette online for Real Money - My Top 10 Tips. Learning how to play roulette online for real money can be fun, exciting, and sometimes profitable. But it’s not easy knowing which version of the game to play or even where you can play safely. In this article, I’m going to explain how to play roulette online for real money and how to maximise your chances of winning. If you don’t win and if I’ve advised you correctly, you’ve at least had fun and enjoyed a long playing session. I’m not going to tell you how to get rich quick, or offer you a fool proof way to win. There isn’t one. If anyone tells you otherwise, they are lying and don’t have your best interests at heart. 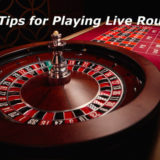 What I am going to offer you is advice on the different types of roulette and playing options, how to play and where the best live roulette casinos can be found. You’ve got two choices when choosing a roulette game to play. You can either play with a live dealer, where a real wheel and table are used. The game is played live in front of you as you bet and watch the dealer spinning the wheel. This is as near to a real casino experience you can get. The alternative is to play a computer simulation, where everything you see is computer generated. The result of the spin of the wheel is determined by the computer using a Random Number Generator. These games tend to be quicker and also offer much lower minimum stakes. My preference is for playing with a Live online dealer. It’s authentic, real, and more trustworthy. If you want the ultimate in trust then you can play at tables that are streamed from Land Based Casinos. This has a single Zero on the wheel. The Return to player for European Roulette is 97.3%. American Roulette, which is a popular alternative, has two zeros on the wheel and a RTP of only 94.74%. You can quickly see which of the two games is better value. Look out for the French Roulette tables. They are exactly the same game as normal European Roulette, but have a slightly different layout on the baize. What’s significant is the La Partage Rule on this type of table. If you play even money bets and the ball lands in Zero, you get half your stake back rather than lose your bet. En Prison is another variant of this. However, rather than get half your stake back, the half bet remains on the table for the next spin. Avoid playing side bets if they are offered, and avoid any game like Lightning Roulette where the base game pays out less for wins than the standard game. The return on these for players is a lot lower than just playing European Roulette. Your bankroll will suffer as a result. If you’re covering the board with chips, never bet more than you can win if one of your numbers comes in. You’d be surprised how many people cover a lot of the board and when they hit a number or a bet, the returns are less than the original total bet. This is a quick way to lose all your money. 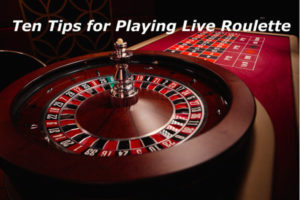 Tip #6 Find a live casino that will give you the experience you want. While roulette is standard, the experience while playing is not. Do you want a fast game? Then Speed Roulette is what you need. Want lots of camera angles? Then Immersive or Prestige Roulette will deliver. Do you like to chat? Then any Live Roulette table will do. Or do you like tournament play or Roulette with Side Bets? Do you have a preference for male or female dealers or for a particular spoken language? If you want specific guidance on any of these, this rundown of the different types of roulette will get you where you need to go. Set a bankroll and decide how much you are prepared to lose or win before you start playing. As soon as you hit either one, leave the table and take a break. Consider putting on deposit limit on your account. This will help prevent you from chasing losses by depositing again soon after you’ve lost. One of the things you should do before you play live roulette is look at reviews of the best live roulette casinos. These give advice on the games, the minimum and maximum stakes you can make, what software platform is being used, how well the casino performs with deposits and withdrawals. Good reviews rank casinos and compare them against each other, so you know which casino is the best for what you are looking for. Also look out for other guides providing advice and tips. A standard roulette table is laid out with two primary betting areas. They are referred to Inside and Outside betting areas. These bets are placed on the inside portion of the table that cover individual or combinations of numbers. There are 37 numbers (1-36 and 0) on a standard European Roulette wheel. A bet on 1 number will return 35:1 in European Roulette. A chip placed on the line between two adjacent numbers, either horizontally or vertically is known as a Split Number Bet which will pay 17:1. This bet covers 3 horizontal numbers in a row. A chip is placed straddling the vertical line on the outside most number in the row. This pays 11-1. This bet covers 0, 1, 2 or 00, 2, 3 or 0, 00, 2 and pays 11:1. A chip is placed on the intersection of 4 numbers. This pays 8:1. The Top Line bet is placed on the line covering 0, 00, 1, 2, 3. This pays 6:1. This is a bet that covers two adjoining Streets. This pays 5:1. Outside Bets refer to the betting area around the outside of the central number grid. These bets cover portions of the table — odds/evens and red/black. A chip can be placed at the head or on a column of numbers that stretches the length of the table. Each Column contain 12 numbers. This pays 2:1. The table is split into 3 blocks of a dozen numbers. A chip placed in one of the dozens. This pays 2:1. A chip placed on the odd or even area on the table pays 1:1. A chip placed on the Red or Black area on the table pays 1:1. A chip placed in this area pays 1:1. As you become accustomed to the betting, you can extend the range of bets you make by covering different areas of the wheel. You’ll see located on the table a Racetrack. This is a representation of the wheel in a smaller form that you can use to place bets with. The racetrack is divided into sections, Voisins du zéro (Voisins), Le tiers du cylindre (Tiers), and Orphelins. Placing a chip in each section will generate bets to cover all numbers of that section. You can also bet on a number and its neighbours using the Racetrack. The more sophisticated games allow you to choose how many neighbours to include. The default is usually two neighbours. Pre-defined betting patterns, like the snake which winds its way across the betting gird, are available at roulette tables at some live casinos if you fancy a bet that is a bit more adventurous. You won’t win on every spin, unless of course you cover the whole board, which is not a good idea if you want to keep your bankroll for a while. This is a losing strategy and one that will definitely not work. Use a strategy that you like — for example, favourite numbers, birthdays, a combination of both, or pretty patterns on the table. Whatever you chose, stick to it. Don’t keep changing as you’ll get even more frustrated should a number you were betting on suddenly come in after you’ve moved away. Be very careful in using recommended betting strategies. None are full proof. They may help you turn over your money more and extend your playing time, but they won’t make you the profits they claim. Take your time, bet what you can afford to lose, and — above all — enjoy yourself. The returns you get when you play Roulette online for real money are some of the best in the betting world. This BBC clip explains the odds of Roulette when compared against other forms of betting. Author Bio:- I (Neil Walker – that’s me) have over 30 years playing experience and I’m considered an authority on online Live Casino and Live Casino Games. I provide player focused reviews, advice and recommendations which I publish on my site www.livecasinocomparer.com.